Autonomous weapon systems: A threat to human dignity? In the opening scene of Christopher Nolan’s Dunkirk, six British soldiers, looking for food and supplies in the deserted streets of Dunkirk, are being shot at by German soldiers. One of them manages to escape, the other five get killed. Would this scene have been more unsettling if they had been pursued and killed not by other soldiers, but by robots instead? Would the death of the British soldiers have been less dignified if an autonomous weapon systems (AWS) had been responsible for it? Many believe exactly that. The philosopher Peter Asaro claims that ‘as a matter of the preservation of human morality, dignity, justice, and law we must prohibit the use of such systems’. Human Rights Watch states that allowing ‘killer robots’ to make life or death decisions conflicts with the ‘principle of human dignity’. Even more forcefully, the former Special Rapporteur on Extrajudicial, Summary or Arbitrary Executions, Christof Heyns, argues that the use of unmanned systems to deliver force in the law enforcement context is an ‘affront to human dignity’ and that it ‘violates the right to dignity of those against whom the force is used’—a line of reasoning that has meanwhile also been taken up by certain State Parties to the Convention on Certain Conventional Weapons in the framework of the Group of Governmental Experts on LAWS. [t]o give a programmed machine the ability to ‘decide’ to kill a human is to abandon the concept of human dignity. Humans are sometimes accidentally killed by machines, but for an autonomous robot/drone to be programmed to kill a human is to treat a rational being as if it were merely an object. In a similar vein, Christof Heyns’ claims that the administration of force by AWS fails to respect the intrinsic value of human beings because it would treat them as mere objects. ‘Death by algorithm’, as he puts it, implies that people are treated like ‘pests or objects, as a nuisance that must be gotten rid of, rather than as someone with inherent dignity’. Still, how exactly is human dignity supposed to be understood to warrant such a conclusion? There is surprisingly little reflection on these questions in the relevant legal and political debates. Rather, in anti-AWS arguments the concept is typically invoked in a rhetorical manner, in the form of an emotional charge or as a conversation stopper of sorts. This prevents a critical examination of the kinds of inferences that may or may not be drawn and the resulting analytical gap risks being filled by politics and partisan interests. In what follows, I will attempt to address this gap and determine whether and to what extent the concept of human dignity can serve as a basis to derive the immorality or illegality of the use of AWS. To that effect, I will apply influential philosophical accounts of human dignity to anti-AWS arguments and show that these arguments are either not sufficient to justify a ban or moratorium on AWS, or that they involve counter-intuitive implications. Philosophers frequently consider human dignity to be a fashionable, yet obscure, label that refers to other more fundamental notions, such as autonomy or personhood. Accordingly, many have been skeptical of the very project of making sense of human dignity. While such skeptical views might have their merit, my goal here is to get a grasp on what scholars, civil society activists and diplomats are doing when they invoke human dignity in anti-AWS arguments. For current purposes I will therefore focus on those philosophical theories that have either influenced a given understanding of the concept of human dignity in current AWS debates or have helped making sense of some of the connotations or implicit assumptions that pervade these debates. Dignity signifies something’s goodness on account of itself. Autonomy is thus the ground of the dignity of the human and of every rational nature (4:436). The connection to value is established when Kant claims that dignity is something that has no price, no ‘relative worth’, but rather an unconditional, ‘inner worth, i.e. 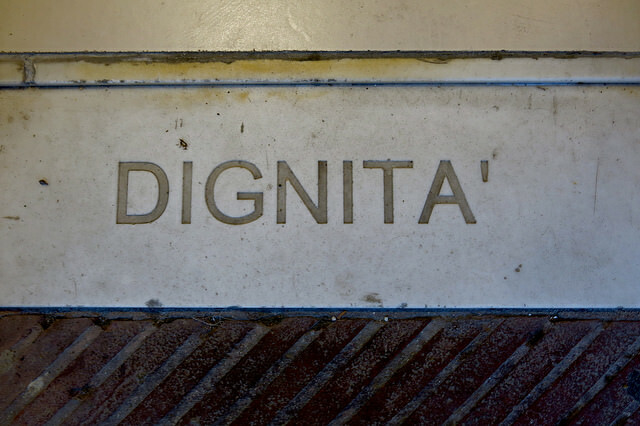 dignity’ (4:435). In sum, according to Kant, autonomy is the source of our dignity, which in turn grounds our unconditional and intrinsic value. It is important to bear in mind that Kant’s understanding of autonomy is different from the way it has come to be used in contemporary legal and political debates, including in the debates on AWS. Kant takes ‘autonomy’ to refer to our capacity to govern our actions by universal moral principles. It is not simply the freedom to make our own choices. Contemporary accounts of human dignity that are influenced by the lines of reasoning put forward by Aquinas and Kant and that link human dignity to value can be found, for example, in James Griffin’s and John Tasioulas’ respective theories of the foundations of human rights. Their accounts both invoke autonomy as the source of human dignity, albeit in very different ways. Griffin, for example, maintains that human rights are grounded in personhood, which he takes to be a matter of normative agency: our ability to develop a conception of a worthwhile life. As opposed to that, Tasioulas holds that human beings have a special moral status, because they share certain specific elements that characterize human nature. In Tasioulas’ view, these characteristic elements of human nature have intrinsic value and are the source of the dignity of human beings. A different strand of philosophical reflection connects dignity with the concept of noble rank or high social status. Arguably, this is where the concept of dignity has its actual historical roots. Thus, for example, in Cicero’s De Officiis we find the idea of the ‘dignity of man’, which, according to Cicero consists in our endowment with reason and our capacity of self-development. Pico della Mirandola, in his oratio known as De Dignitate Hominis offers a slightly different rationale for the special status of human beings. He declares that man is superior to all other creatures and deserves not only the greatest admiration, but also the greatest honor because man is free to ‘choose […] and to be that which he wills’. [T]he modern notion of human dignity involves an upwards equalization of rank, so that we now try to accord to every human being something of the dignity, rank, and expectation of respect that was formerly accorded to nobility. As we have seen above, anti-AWS arguments frequently employ Kantian terminology when invoking the concept of human dignity. Unfortunately, however, in none of these arguments do we get an account of how exactly human dignity is violated by the employment of AWS. This is not satisfactory. Unless it can be shown why the concept of human dignity mandates the prohibition of AWS, such a prohibition is not justified. Let us therefore assume that human dignity stands for unconditional, intrinsic value. Let us assume further that this intrinsic value has its source in our autonomy, understood as our ability to make self-determined choices. What can plausibly follow from such an understanding regarding the use of AWS? To be sure, if we are hurt or killed against our will, it severely impacts our ability to make our own choices. Hence, to allow AWS to deliver force is certainly incompatible with the moral value of autonomy. But how are AWS different in this regard from regular weapons? After all, any type of weapon or method of warfare, be it a remote-controlled long-distance missile, a drone, an air strike or conventional ballistic weapon, is designed to seriously harm human beings. What is it about AWS that renders them particularly reprehensible from the point of view of human dignity? I fail to see what the relevant argument could look like and have also not found any satisfactory explanation in the literature. Note that I am not saying that there are no morally questionable aspects in the employment AWS, there certainly are. My point is simply that if the morally significant dimension is taken to be human dignity, and if human dignity is understood as a value that has its source in our capacity for self-determination, then the relevant incompatibility is not restricted to a specific weapon system, but is shared by any type of force that harms our agency. Can a Waldron-style understanding of human dignity come to the rescue and make better sense of anti-AWS arguments? Let us assume that human dignity consists in the high status that human beings occupy in the order of the universe. On such an understanding one might well argue that any use of force by an entity that occupies a lower status fails to grant human beings the respect and deference that they deserve and is therefore a violation of human dignity. The problem is of course that this is precisely not the understanding of human dignity that is typically presumed in anti-AWS arguments. As we have seen, proponents of a ban or moratorium on AWS typically rely on a value-based understanding of human dignity. Anti-AWS arguments are therefore either obscure by drawing unjustified inferences or, if the inferences can be justified, they must be based on a different conception of human dignity than the one that seems to be endorsed. Finally, note that endorsing a Waldron-style account of human dignity to make sense of anti-AWS arguments is also not without its difficulties. To begin with, it would imply that it is also a violation of human dignity to be killed by other entities that occupy a lower status in the hierarch of beings, such as animals, bacteria, or even viruses. This strikes me as counter-intuitive. Moreover, it would have to be clarified why AWS that are endowed with artificial intelligence would necessarily occupy a lower status than human beings. It is problematic to simply stipulate that it is a matter of respect for the high-ranking status of human beings that they do not get hurt or killed by non-humans. This gives rise to the suspicion that ultimately, it all boils down to a form of speciesism: that in the hierarchy of being we simply consider ourselves to be the most valuable form of existence and demand to be treated accordingly, without bothering to explain why this is supposed to be the case. It might well be that proponents of a pre-emptive ban of AWS presuppose a very different understanding of human dignity which would make it much more evident why such a ban would follow. But if that is the case, they must make the relevant argument and spell out the specific understanding of human dignity they presuppose. Otherwise, the use of human dignity is reduced to a rhetoric maneuver, an empty shell, which, depending on the context and purpose of its use, has a very different theoretical underpinning. As I see it, this renders the employment of human dignity not only extremely unattractive in trying to make a specific legal or political argument. It also renders the concept vulnerable to manipulation and thereby undermines the credibility of the debate in question. Given the importance of a serious legal and political engagement with the possibilities and limitations of AWS, such an outcome should be avoided at all cost. In order to advance the AWS debate it is therefore preferable to refrain from using the concept of human dignity altogether, at least as long as no consensus regarding its proper meaning has emerged and the relevant assumptions remain unarticulated. Ariadna Pop holds a Ph.D. in Philosophy from Columbia University, New York, and is currently working as a diplomat for the Swiss Federal Department of Foreign Affairs. The views and opinions expressed in this post are those of the author and do not necessarily reflect the official position of the Swiss Government. Lethal Autonomous Weapons Systems, Human Rights and Ethics, 9 April 2015, https://www.unog.ch/80256EDD006B8954/(httpAssets)/4107E2BB7C277642C1257E23006271E0/$file/Chile_LAWS-HR-Ethics.pdf; Costa Rican Intervention at LAWs, 14 April 2016, https://www.unog.ch/80256EDD006B8954/(httpAssets)/CC4712113BA981C7C1257F9B002CF165/$file/2016_LAWS+MX_HREthicalIssues_Statements_CostaRica.pdf. See, for example, J. Griffin, 2002, “A Note on Measuring Well-being”, in C.J.L. Murray (ed. ), Summary Measures of Population Health: Concepts, Ethics, Measurement and Applications, WHO, p. 129-134; R. Macklin, 2003, “Dignity Is a Useless Concept”, in BMJ, p. 419–1420; S. Pinker, 2008, “The Stupidity of Dignity” in The New Republic; A. Schopenhauer, 2005, The Basis of Morality, translated by A.B. Bullock, 2005. While this article demands a philosophically substantive definition and argument for human dignity, such a response requires both more time and more space than this comment box allows. But such a substantive definition exists, and is not so remote or ineffable as this commentary might suggest. And is thus susceptible to the same criticism. We mainly consider the arguments against AWS with regard to the Human dignity of the victims of such weapon. However, we should keep in mind that it is not only the human dignity of the victims of AWS that is at stake here, it is also the one of users of such weapon. They renounce to their human dignity because they leave their decision of killing or not to a program which has no access to morality and freedom of will. In this sense we may also argue that AWS are against human dignity.